The division was the largest permanent formation in the land forces of most participants in the Second World War. It varied in size from 6,000 to 25,000 men and was usually led by a major general or lieutenant general. The army division should not be confused with the naval command echelon called a division, which consists of just ten to thirty men under a junior officer. Divisions in Western armies were organized into corps. United States. U.S. infantry divisions normally consisted of three infantry regiments, an artillery regiment, and an engineer battalion, with other supporting elements. The authorized strength in 1943 was 14,253 officers and men. The three infantry regiments each had a strength of 3118 men; the artillery regiment comprised 2160 men, 36 105mm howitzers, and 12 155mm howitzers; and the engineering battalion numbered 647 men. In addition, there was a reconnaissance troop (company) of 155 men, a medical battalion of 465 men, a quartermaster company of 193 men, an ordnance company of 147 men, a signals company of 226 men, a military police platoon of 73 men, a headquarters company of 110 men, and a marching band of 58 men. The total weapons count was 6518 rifles, 243 automatic rifles, 157 0.30 machine guns, 236 0.50 machine guns, 90 60mm mortars, 54 81 mm mortars, 557 bazookas, 57 57mm antitank guns, 54 105mm howitzers, 12 155mm howitzers, and 2012 vehicles. U.S. soldiers tended to identify with their division, particularly in former National Guard divisions, which were regional in character. Prior to the war, the U.S. Army still had a number of square divisions containing four regiments organized into two brigades. This organization was less flexible than the three-regiment triangular division, and the square divisions were in the process of being triangularized when war broke out. The extra regiments were organized into new divisions or broken up for cadre. 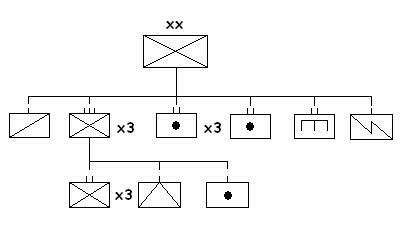 The U.S. Army made the decision to retain much of the supporting units for divisions at the army level, in order to keep divisions as flexible and mobile as possible. For example, supplies were expected to be delivered to individual battalions directly from army-level depots, and certain supporting arms were raised as independent battalions controlled at the army level and assigned to divisions as needed. These included independent tank battalions, tank destroyer battalions, antiaircraft battalions, and chemical mortar battalions. This did not work out especially well. Most divisions began using their organic transport to distribute supplies received from army-level depots, and it was found that tank battalions needed to train with the infantry they would support to achieve adequate tank-infantry coordination. As a result, there was a tendency to attach a tank battalion to each infantry division on a semi-permanent basis, though this did not become a formal part of the division table of organization and equipment until after the war had ended. Marine divisions resembled Army infantry divisions, but were slightly larger (17,465 officers and men in 1944) and formalized the attachment of a tank battalion early in the war. This battalion consisted of 36 Stuart light tanks in 1942. The 1942 organization also included a special weapons battalion equipped with two 37mm antitank gun batteries, a 40mm antiaircraft battery, and a 75mm self-propelled gun battery. The engineer battalion was joined by a pioneer battalion (for unloading supplies on the beach) and, early in the war, a Naval Construction Battalion. For a short time these were organized into a single engineer regiment in the division, before the Navy pulled the Seabees out of the Marine divisions. As LVTs became available, an amphibious tractor battalion was assigned to each division. No armored divisions saw combat in the Pacific, but one airborne and one cavalry division were assigned to the Southwest Pacific Area. 1 Cavalry Division retained the square structure (two brigades of two regiments) and fought as elite infantry. 11 Airborne Division also fought largely as elite infantry, with its elements making only two combat drops during the war. It had a triangular structure, with two glider infantry and one parachute infantry regiment when first deployed. Later the ratio was reversed, so that the division had one glider infantry and two parachute infantry regiments. Britain. British divisions had brigades in the place of regiments, but otherwise resembled American divisions. Each brigade consisted of three or four battalions. The battalions could be drawn from various regiments, which in the British system were regional recruiting and training formations that were the repositories of military tradition. For this reason, British troops identified with their regiment rather than their division. China. The typical Chinese division was triangular, with a manpower of 10,923 on paper. The actual strength was typically 6000 to 7000 men. There was no real replacement system. Authorized equipment was 3,821 rifles, 274 light machine guns, 54 heavy machine guns, 243 grenade launchers, 16 mountain guns, and 30 battalion guns, but, again, only on paper. In practice, a Chinese division had barely enough rifles for its men, a third the number of machine guns of a Japanese division, and no other support elements to speak of. It was reckoned that a Japanese division had the combat strength of three Chinese divisions under even the best of conditions (for the Chinese). A few Chinese divisions were organized, trained, and equipped to a higher standard. The Germans had trained about 30 divisions for Chiang in the late 1930s, but most of these were destroyed at Shanghai in 1937. Later the Americans organized a training camp at Ramgarh in India that trained and equipped a handful of divisions to a standard previously unknown in the Chinese Army. These divisions fought mainly in Burma. Japan. Japanese divisions were highly variable in composition, with some garrison divisions consisting of just 6,000 men, while a few divisions retained the square organization and had as many as 25,000 men. However, the organization of most divisions resembled that of a U.S. infantry division, with three infantry regiments organized into an infantry group. There was no officer rank between colonel and major general in the Japanese Army, and divisions were commanded by lieutenant generals. The infantry group was commanded by a major general who also acted as deputy division commander. The Japanese divisions that fought in the early battles in China were regular or Type A divisions and "special" or wartime divisions composed mostly of reservists. As the war dragged on, a number of additional regular divisions were activated; some as Type A divisions, using regiments released by triangularization of existing Type A divisions, and others as Type B divisions, built around cadre from disbanding a number of wartime divisions that had seen service in China. The standard or Type B triangular division had, in addition to its three infantry regiments, a reconnaissance regiment with 16 light tanks or armored cars; an artillery regiment with 36 guns; and an engineer regiment. The artillery regiment was highly variable in composition, from 24 75mm guns and 12 105mm howitzers to 12 each of 75mm guns, 105mm howitzers, and 150mmhowitzers. The combat units were supported by a signals unit, a transportation regiment, an ordnance unit, a medical unit, three field hospitals, a water supply unit, and a veterinary hospital. The latter supported the division's 3466 horses, for there was typically only 310 trucks. Total weapons counts were 6867 rifles, 264 light mortars, 273 light machine guns, 78 heavy machine guns, 14 37mm antitank guns, 18 70mm howitzers, 12 75mm infantry guns, 36 artillery pieces of 75mm to 150mm, and 16 light tanks or armored cars. Total manpower was 15,220 officers and men. The Type A were reinforced to about 20,000 officers and men with improved equipment while retaining essentially the same organization as the "Type B" divisions. Type C divisions were wartime divisions organized as two brigades of four battalions each, without a regimental echelon. These had a smaller manpower than a triangular division, about 12,000 officers and men, and they had almost no artillery and no reconnaissance regiment. They were intended primarily for garrison and antiguerrilla duty. They were distinct from "Special" wartime divisions having a triangular structure. In October 1943 the Army published a new TO&E for an ocean division. This consisted of two static defense regiments and an amphibious regiment. Two divisions were immediately converted to the new organization, and another three a few months later. The divisions proved well suited for deployment by sea but had poor mobility once landed. Allied intelligence got wind of the reorganization, and concluded these divisions had an experimental "regimental combat team" organization, with artillery and other heavy weapons permanently distributed to the individual regiments. Almost all the divisions raised in 1944 and 1945 lacked reconnaissance regiments, and many were badly understrength in artillery. Few of those raised in 1945 had more than a battalion of artillery. In 1945, the Japanese began raising coastal and mobile divisions for the final defense of the home islands. Mobile divisions had three infantry regiments and an artillery regiment, but no reconnaissance regiment. They were given relatively young, fit officers and men and as many active duty soldiers as could be scraped together. Coastal divisions had a single battalion of artillery, three static regiments with virtually no mobility (so that they were expected to fight to the death where they were positioned), poor weaponry (with some men equipped with no more than bamboo spears), and a single mobile regiment for local counterattack. By May 1945, mobile divisions no longer were assigned any artillery and coastal divisions were reduced to three regiments. The Japanese Army also raised a large number of independent mixed brigades, which typically had about five infantry battalions and a battalion of artillery along with supporting units. In some respects, the independent mixed brigades resembled small divisions with a very narrow division slice, and some were eventually redesignated as divisions. Japanese infantry divisions were typically raised on a regional basis, like British battalions or U.S. National Guard divisions, but at all echelons. For example, the men in a particular company might all be from the same small town. This contributed greatly to unit cohesion, but it also meant that the destruction of a unit was devastating to the folks back home in the town from which the unit came. Japanese citizens from Gifu Prefecture still make visits to Mount Austen on Guadalcanal, where two regiments recruited from their fishing villages were annihilated in 1943, to search for remains. The Japanese assigned one or more depot divisions to each divisional district. These were training formations whose function resembled that of British regiments in a number of respects. In peacetime, the depot divisions trained each years' class of conscripts. If war suddenly broke out, the bulk of the depot division was used as cadre and filled out with reservists to create a field division, usually bearing the same number as the depot division, which could quickly be committed to combat. The remainder of the depot division was then rebuilt with other reservists or conscripts. During a more prolonged war, when a new division needed to be raised, a small nucleus of cadre was drawn from a depot division and filled out with reservists and conscripts to create a new field division with its own number. This new division was billeted in its own wartime barracks while undergoing as much training as the situation permitted before being committed to combat. Depot divisions were also responsible for providing replacements to field divisions, usually those that were earlier raised from the same divisional district. Late in the Pacific War, the Japanese Army began creating Field Replacement Units for its divisions. Each unit had two infantry battalions plus supporting elements, not necessarily drawn from the same divisional district, and after training together the unit was sent to a theater, where it might be broken up to provide replacements for several divisions. The Army also began using experienced troops drawn from divisions in quiet sectors to provide replacements for other divisions that had suffered heavy losses. Both methods of replacement were disliked by the Army because of their tendency to reduce unit cohesion, and so were regarded as measures of desperation. The Japanese activated four armored divisions during the war. These were originally square divisions, with two brigades of two tank regiments and a single mobile infantry regiment, but by the end of the war the Japanese had settled on a triangular organization of three tank regiments and a mobile infantry regiment. The infantry were transported by 300 trucks and the tank regiments each were allocated 31 light and 50 medium tanks plus 76 trucks. There was also an artillery regiment of 12 75mm guns and 24 205mm howitzers, an antiaircraft unit, a reconnaissance unit with 32 light and 10 medium tanks, and other supporting elements. Divisions in all armies had a considerable number of men assigned to support duties, with only a fraction normally on the firing line. In addition, there were considerable numbers of nondivisional troops. The total manpower under arms per division is known as the division slice. This includes non-divisional support troops, including in some calculations the associated air forces. The U.S. Army had the broadest division slice, with large numbers of supporting troops. This contributed to superb logistics and engineering support, but it also led to a severe shortage of replacements for rifle companies by late 1944. Japanese divisions had a very thin division slice, which reduced their staying power considerably, because the support services just weren’t there when they were needed. British divisions were somewhere in between. The U.S. division slice varied by theater during the Second World War. It was calculated (Leighton and Coakley 1955) at 35,480 men in Europe; 32,481 in the Mediterranean; 34,340 in the Southwest Pacific; and 53,020 in the Central Pacific at the end of the war. The latter calculation is distorted by the presence of Marine divisions that received some Army support but were not included in the calculation. If we take 34,000 as a typical figure, and take the division strength as about 13,500 men, then support troops constituted 60% of total strength. In other words, in the U.S. Army, it took about three men to support every two combat soldiers.